Extend your life expectancy by cleaning the indoor air you breathe with an air purifier. You eat well, don’t smoke, exercise fairly regularly and drink alcohol in moderation – and yet, some days, you feel like you’ve been hit by a large bus. Because air pollutants are often not visible to the naked eye, many of us don’t realise just how debilitating poor quality indoor air can be on the human body – but the effects of indoor air pollution should not be overlooked. They range from short-term afflictions – like eye, nose and throat irritations – to more serious long-term effects like respiratory disease and even cardiovascular conditions. And, while we may think we can eliminate common culprits like pet dander, dust, smoke and mould spores by keeping a clean home or office, the fact is that dusting and vacuuming are simply not enough to remove all these daily pollutants from the air we breathe. But fret not, because it’s not all doom and gloom for those after a life of health and longevity in a world where clean air seems like an unattainable ideal – help is at hand. Think of air purifiers as pollution-busting superheroes – except these clean air crusaders are by no means fictitious or out of reach – they are practical, affordable and dependable devices that have been proven to improve and lengthen lives, if not save them. Air purifiers work by way of HEPA (high-efficiency particulate air) filters that clean and purify the air that is circulated – and that you breathe daily – indoors. HEPA filters physically trap the tiny particles that vacuum cleaners and other cleaning equipment merely recirculates into the air. A health must-have in your home or office, air purifiers not only clear airborne bacteria quickly and quietly, they are also very effective in the removal of odours, allergens and other pollutants that are inevitably present in indoor air. In fact, research has shown that HEPA filters remove about 99.9% of dust particles and impurities from the air. According to The New York Times, studies have found improved air quality has prevented tens of thousands of premature deaths from heart and respiratory disease. Simply put, “Clean air, longer life” (Harvard Magazine). The conclusion: air purification equals the removal of impurities…equals clean air…equals better health…equals longer life. So you have to ask yourself, can you afford not to invest in an air purifier? For information on pbOffice’s range of air purification systems, visit our Air Purifiers web page, or call 010 300 4893. Investing in a good quality air purifier will create a pure-air haven for you and your family, curbing those pesky summer sniffles. It’s the height of summer, many South Africans’ favourite season and a time when you should be enjoying the radiance and outdoor activities the season brings – but you feel like you’ve been battered with a winter flu stick. If this sounds like you – runny nose, watery eyes, sneezing, coughing, itchy eyes and nose – you may be one of the many people who suffers from seasonal allergies, also known as hay fever. This is a type of inflammation in the nose caused by the immune system overreacting to allergens in the air. Although pollen is the primary culprit, other common airborne irritants like pet dander, smoke and dust exacerbate the condition. According to the Allergy Society of South Africa, up to 20% of South Africans suffer from allergic reactions, with hay fever being rife – especially during change of season. And, although this often overlooked ailment does not come with the same level of notoriety that winter conditions like flu do, it can be just as debilitating. And it is not only during waking hours that hay fever affects health and performance. According to research, two-thirds of hay fever sufferers continue to experience symptoms while trying to sleep. “[These people] are losing an average of more than an hour of sleep a night as they struggle with streaming noses and itchy eyes,” writes the UK’s Daily Mail. But don’t cancel your summer plans just yet – the good news is, there are sure-fire means of managing and mitigating hay fever symptoms considerably. pbOffice, a division of PBSA, offers you one of the most safe and effective of these with its German-made indoor air purification systems by IDEAL. Studies have shown that people spend around 90% of their time indoors – a figure that is rising, not abating – and indoor air can be up to 100 times dirtier than the air outside. Unlike the outdoors, airborne irritants and bacteria are largely trapped, churning constantly in the indoor air that we spend so much time breathing in. A good quality air purifier in your home and office environment can trap up to 100% of these summer spoilers, including germs, dust, pet dander, smoke, pollen, mould spores, odours and vapours and various allergens. Award-winning online information source HowStuffWorks, confirms air purifiers – in particular those that have met the strict regulations and attained HEPA (high efficiency particulate air) certification – can help with allergies. pbOffice’s range of top-quality air purifiers feature all the vital mechanisms that are needed to turn contaminated, harmful indoor air into clean, allergen-free air – including HEPA filters and intelligent air quality sensors. Our devices work on a multi-stage air purification system, which filters almost 100% of the smallest particles and pathogenic germs from the polluted air before they reach your airway. Investing in an air purifier for your home and office will allow you to breathe and sleep better, by turning your indoor environment into a safe, clean haven away from the wave of airborne irritants that vex you on a daily basis. For more information, visit our Air Purifiers web page or call 010 300 4893. In the continued quest to bring healthy, pure air to your indoor spaces, pbOffice – a division of PBSA (formerly Pitney Bowes SA) – has just introduced a new IDEAL air purifying combination unit, the AW60. Suitable for rooms of up to 60m², the IDEAL AW60 builds on its popular predecessor, the AW40, and features an additional HEPA combination filter and automatic function. The latest addition to the air washer family combines air purification with optimal humidification, for ideally purified and humidified air. 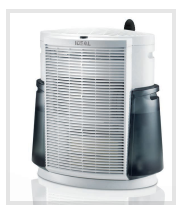 The device has a HEPA combination filter with integrated carbon anti-odour filter. Water, as a natural filter, works together with the HEPA filter to efficiently bind dust, allergens and particle-bound odours in the air. At the same time, the AW60 provides optimal air humidity through specifically structured humidifying disks and by applying cold evaporation. To create a healthy indoor climate, air humidity is kept within the optimal range of 40% to 60% by a fully automated function on the AW60. Additionally, the automatically selectable PlasmaWave system actively removes bacteria, viruses and mould spores from the indoor air, while antibacterial CleanCel technology on the water tank and humidifying disks inhibits the growth of bacteria, fungi and acarids. The device features high-quality touch control and modes for automatic, manual and sleep. In automatic mode the AW60 monitors the air humidity by means of the hygrostat, and automatically adjusts the power – although this can also be controlled manually. Night mode allows for ultra-silent operation – an ideal mode for bedrooms. There is also a timer function for optimal pre-selection of the desired runtime, including two, four or eight hours. Easy to clean and maintain, the AW60 is also very energy-efficient. You breathe approximately 10 000 litres of air – not to mention all the undesirable elements in it – through your lungs on a daily basis, which is why clean breathing air is so important when it comes to your health. With nearly 100% of unwanted substances – including exhaust fumes, viruses and bacteria, tobacco smoke, dust, mould, building chemistry, fine dust, aerosols, animal hair and pollen – posing a risk to your health and wellbeing, you want to make sure these elements are removed from the air you breathe. This is where IDEAL comes in. The Germany-based maker of machines that turn the indoor air you breathe into something only nature can produce – fresh, clean, natural air – has launched two new air purifier and humidifier products, the air washer IDEAL AW40 and IDEAL ACC55 combination device. While the AW40 washes indoor air, the two-in-one ACC55 device both washes and filters it. The AW40 – an “air washer” for clean and humidified indoor air – is suitable for spaces of up to 40 m² and has automatic function. Recommended for allergy sufferers, the AW40 cleans and humidifies air without the use of any consumables. It also features the anti-bacterial Ionic Silver Stick®, is low on energy consumption and operates silently. The air washer produces clean air and combines this with ideal humidification. Water – a natural filter – binds contaminates such as dust, allergens and particle-bound odour, all without any additional consumables or replacement filters. Thanks to the integrated humidity switch, the air humidity can be controlled at the push of a button to achieve an ideal room climate. A digital humidity display shows the relative humidity in the room at the push of a button even if the device is turned off. The AW40’s cleaning mode automatically indicates when to clean the device, to refill the water tank or to replace the Ionic Silver Stick®. All components can be removed from the case with a single movement. An intelligent light sensor automatically switches the air washer to night operation, which includes automatic dimming and display at night time. This makes the device ideal for use in bedrooms or children‘s rooms. The air washer also features an automatic switch-off function, which kicks in when the water tank is empty. 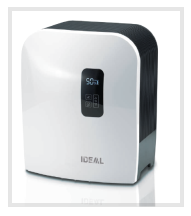 The IDEAL ACC55 – another combo unit that cleans and humidifies indoor air – guarantees a healthy room climate throughout the year. The ACC55 not only ensures clean air by filtering the smallest particles from the air, but also provides ideal air humidity via an evaporator system at the same time. Suitable for rooms up to 55 m² and also highly recommended for allergy sufferers, the device features a permanent pre-filter that stops hair, house dust and other major particles of dirt before they get to your airwaves. A downstream HEPA fine particle air filter filters almost all particles, pollen, bacteria and viruses, while an activated carbon filter absorbs bad odours. The evaporation pad, which sees to air humidification, features an evaporator cassette. This is covered with an anti-microbial layer for self-regulating hygienic cold vaporisation that prevents microbial growth. Featuring a blue LED operation display, the ACC55 is energy efficient and has an extremely smooth-running motor for super-silent operation.